Two decades after recognising that art restoration “discoveries” and “revelations” had become very big business, we encounter a blockbuster exhibition that required a Government indemnity of £1.5 billion and was specifically launched as a vehicle to celebrate a restoration that had yet to take place: “We started thinking about this five years ago, when we were beginning to plan the restoration of ‘The Virgin of the Rocks’, so an exhibition to celebrate that project seemed like the right thing to do.” So said Luke Syson, the curator of the National Gallery’s “Leonardo da Vinci: Painter of the Court of Milan” exhibition, in a BBC interview. Museum restorations never take place in vacuums. If you build an exhibition on the proposed restoration of a very famous artist’s work you set certain narrative expectations in motion; create pressures and hopes of big, dramatic results. When the “Virgin of the Rocks” was put back on display after its restoration – and pronounced an entirely autograph Leonardo, even though the restorer had not removed all of his predecessor’s varnish – I was pleased to discuss the then forthcoming Leonardo exhibition with Luke Syson who said that its scholarly focus would be an analysis of the influence that a new type of Leonardo painting had had on his followers. Namely, that during the 15 or so years long gestation of the National Gallery’s version of the “Virgin of the Rocks” which was delivered unfinished in 1508, and the contemporaneous (1492-98) “Last Supper” in Milan, Leonardo’s painting style had become distinctly abstracted, less naturalistic and more metaphysical in character. When I expressed scepticism that this thesis might rest secure on two such different works as the “Virgin of the Rocks”, with its uncertain condition and status (the Gallery admits the picture is “manifestly uneven in finish and execution” and that there has been “a good deal of agreement that Leonardo himself painted little or none of it”), and the degraded, fragmented, many-times restored “Last Supper”, Syson disclosed that the Royal Academy’s full-size copy of the latter by Giampietrino was being borrowed. At this, I asked if the Gallery’s own Giampietrino “Christ carrying his Cross” (which had recently been relegated to the reserve collection – on Syson’s instruction, I learned) would also be included in the exhibition. It would not. This was disappointing – and a lost opportunity to right an ancient wrong. 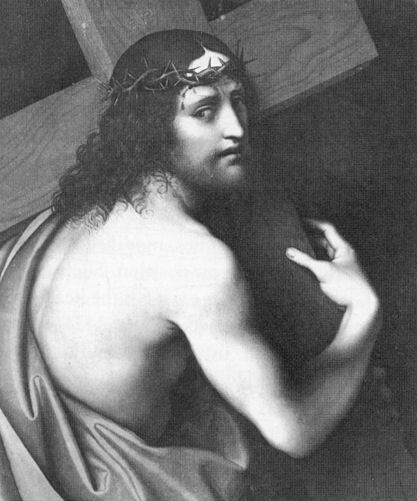 The “Christ carrying his Cross” had been discussed by Larry Keith, the Gallery’s new head of conservation who has restored the “Virgin of the Rocks”, and Ashok Roy, the Gallery’s head of science, in the Gallery’s 1996 Technical Bulletin under the title “Giampietrino, Boltraffio, and the Influence of Leonardo”. This followed the restoration of two Giampietrinos (his “Christ” and his “Salome”) and Boltraffio’s “Virgin and Child”. A remarkable technical discovery had been made on “Christ carrying his Cross” the ramifications of which seemed not fully to have been appreciated. Keith and Roy did acknowledge that Giampietrino’s Leonardo borrowings were “not restricted to matters of composition alone, but also include other aspects of painting technique”; they granted that the “strong chiaroscuro and dark backgrounds of Giampietrino’s small format panels are clearly an attempt to emulate the more striking pictorial effects that Leonardo had introduced to Milan”; they explicitly acknowledged that Giampietrino’s painting technique was much influenced by Leonardo’s, and that this could be “seen in the sfumato and relief of the National Gallery Christ carrying his Cross” – which painting was “clearly derived from Leonardesque prototypes” and for which “A silver-point study of Christ carrying his Cross by Leonardo [was] clearly the compositional source…” And yet, despite all of this, they seemed at pains to cast Giampietrino as a pronouncedly lesser follower of Leonardo than Boltraffio. While excluded from the forthcoming show, Giampietrino’s “Christ” has at least been liberated from the reserve collection, making it possible for the picture and its condition to be studied before visiting the Leonardo blockbuster. Not only is it as closely related to Leonardo’s imagery and methods as has been acknowledged, it is arguably the best preserved Renaissance picture in the National Gallery. Its good condition is a byproduct of what the Gallery describes as “an unusual pigmented glaze layer”. After carefully building and modelling his forms with successive layers of paint and glazes to “an illusion of relief”, Giampietrino covered the whole painting with a single “final extremely thin overall toning layer consisting of warm dark pigments and black”. This had had remarkable aesthetic and physical consequences. The layer was contemporary with the painting and, being composed of walnut oil with a little varnish, resistant to the usual varnish stripping solvents. The use of walnut oil further relates this picture to the “Virgin of the Rocks” where that oil had been used throughout. 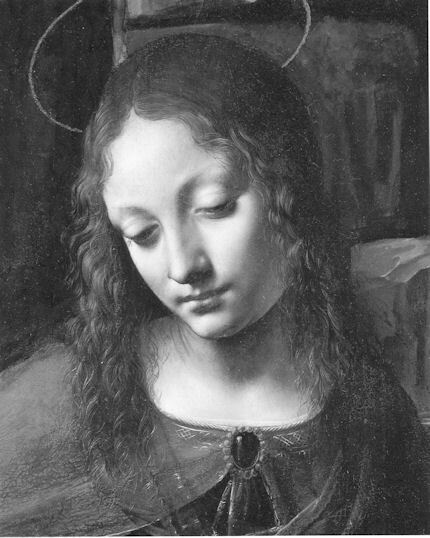 When Larry Keith writes in the current catalogue that Leonardo exploited oil paint in the “Virgin of the Rocks” for its “subtle transitions and distinctions within the deepest tones, all of which were carefully orchestrated within a system of unified lighting”, he might as appropriately be describing the well-preserved effects of Giampietrino’s “Christ” as those in the “Virgin of the Rocks” where, despite the picture’s acknowledged “inconsistencies” of finish, Leonardo is said to have created a “new and remarkable unified coherence…by a carefully considered manipulation of lighting, colour and tonal values”. Whatever the merits of Giampietrino as an artist, no Renaissance work in the Gallery shows a more tightly and subtly controlled overall development of forms, tones, colours, and expressively purposive lighting, than his “Christ”. 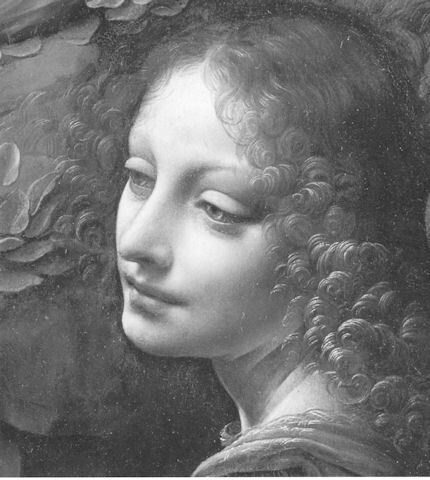 It was unjust if not perverse when Keith/Roy, gave the laurel to Boltraffio, in part as “an artist capable of a more subtle understanding of Leonardo” but also as one who had been working in Leonardo’s studio “by 1491”, as opposed to Giampietrino of whom “it is not certain how much direct contact [he] would have had with Leonardo’s actual painting methods, and it would be misleading to assume that the imitation of Leonardo’s effects required direct reproduction of his techniques.” Under what circumstances and on whose authority other than Leonardo’s, might someone have made a full sized, exactly matching, oil-painted copy of the “Last Supper”? Besides which, in the current catalogue, Minna Moore Ede, when describing Giampietrino’s copy of Leonardo’s “Last Supper” as being with its “great clarity and three-dimensionality” the most faithful and accurate record of all, discloses that Giampietrino, just like Boltraffio, is now understood to have been a live-in apprentice who joined Leonardo’s workshop in the mid 1490s. In the Technical Bulletin Keith/Roy saw “differences of palette” between the “more highly saturated local colour” of Giampietrino’s copy of Leonardo’s “Last Supper” and a “pictorial unity produced by a tightly controlled, restricted range of tone and value” in the work itself. 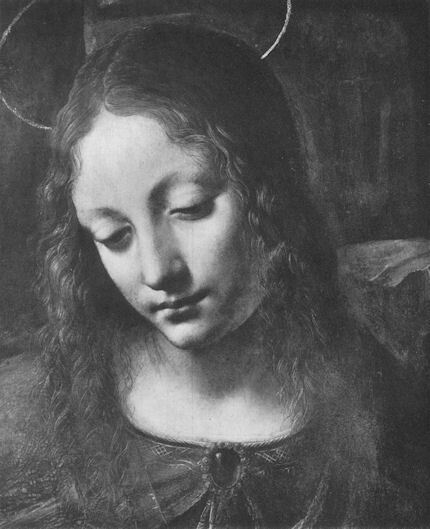 That reading has been dropped: Keith now sees (Leonardo exhibition catalogue entry, p. 70) that the “Last Supper” was, as Giampietrino’s copy had testified, executed in a “higher-keyed, lighter palette” than that of the London “Virgin of the Rocks”. 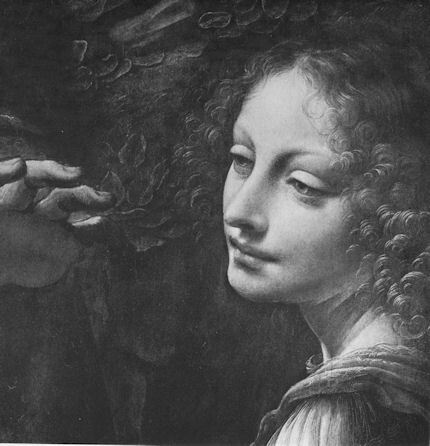 The late-discovered existence of Giampietrino’s dark toning layer constituted a repudiation of the Gallery’s former head of science, Joyce Plesters, who (in the Burlington Magazine in 1962 – “Dark Varnishes – Some Further Comments”) had parodied the very idea as a “crude device of indiscriminately deadening all the colours by the application of an overall yellow, brown, or blackish varnish”. In 1996 Plesters was then still alive (as was a long-serving trustee of the National Gallery, Denis Mahon, who had joined her in attacks on Gombrich in the 1962 Burlington Magazine – “Miscellanea for the Cleaning Controversy” ). In 1996 I asked Gombrich if the Gallery had informed him of its discovery of an overall toning layer of “warm dark pigments and black in a medium essentially of walnut oil, with a little resin”. He said not but that he was pleased to learn of the Gallery’s “final conversion to an obvious truth”. We published our first account of this episode thirteen years ago (“The Unvarnished Truth”, Art Review, November 1998). Could it be that a continuing institutional desire to spare the posthumous blushes of departed Gallery players who bungled in spectacular fashion is permanently to blight an interesting artist’s reputation, retard the gallery’s own (in many respects admirable and generously shared) scholarship and thwart full recognition of the achievements of one of the most distinguished art historians to have made home in this country? Above, Fig. 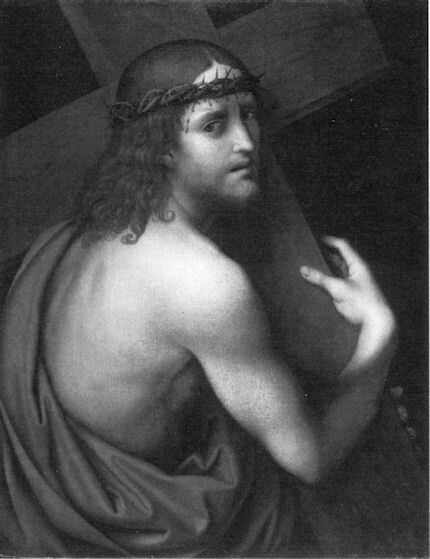 1: “Christ carrying his Cross” by Giampietrino. NG 3097, c.1510-30. Poplar, 60 x 47 cm. Above, Fig. 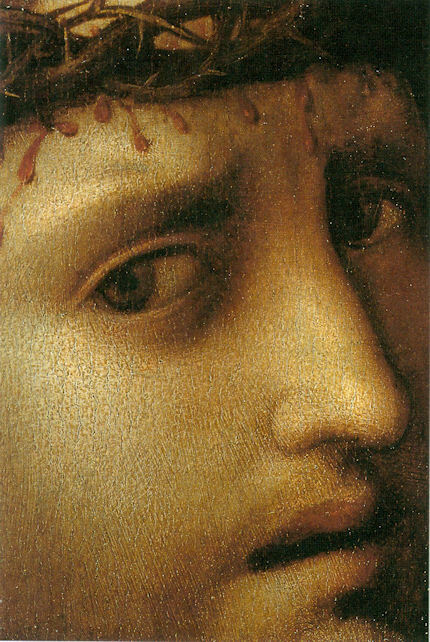 2: “Christ carrying his Cross”, by Giampietrino, detail. Above, Fig. 3: “Christ carrying his Cross”, NG 3097, greyscale. It is shown in Technical Bulletin 17 that the National Gallery version above is one of a number of replicas. The version below has been shown to have used the same cartoon as the NG picture – which makes the differences the more intriguing. The most striking of these concern the orchestration of tonal values: those in the NG picture are greatly more integrated and unified – melded “in space”, as it were. In the Budapest picture, the component parts (cross;figure;drapery) are individually modelled but remain pictorially/conceptually discrete. The implicit light source in the London picture is remarkably focussed and theatrically directed to expressive ends, with the brightest lights falling on Christ’s shoulder, wrist/hand, and right brow. The gradations of tone in the figure are superbly nuanced, and run off into darkness in every direction as the eye moves away from the triangulated intensely local highlights. As a result of these (essentially) tonal variations, Christ advances more from the background, and even from the cross, into a more movingly, affectingly intimate relationship with us. Tones matter. That the so-striking and charged differences between the two versions arise in works made from the same drawing, poses a number of questions: Were the paintings wholly executed by the same artist? Did the Budapest version ever have the same refinements of modelling and the same, effectively, proto-Caravaggesque lighting? If so, had these been injured or removed in restorations? (We saw in our post of January 27th how the Giampietrino “Salome”, which was restored along with his “Christ” – but which did not have a super-imposed ancient walnut oil covering – suffered serious degradations in its tonal manipulations.) Do any of the other versions have overall toning layers, or fragmentary evidence of such former layers? If not, what accounts for the very high tonal sophistication and fluency of the London picture? Above, Fig. 4: “Christ carrying his Cross”, by Giampietrino, Budapest, Szepmuveszeti Muzeum. Above, Fig. 5: The Virgin’s head from the London National Gallery “The Virgin of the Rocks”, about 1491 – 1508, oil on wood, as shown in Kenneth Clark’s 1938 book “One Hundred Details from Pictures in the National Gallery”. In 1990 the Gallery republished Clark’s book but with new photographs in colour. Fig. 6, below, is the same detail as in Fig. 5 (here converted to greyscale). The differences are striking. Yes, if he is right – but what counts as “right” in matters of attribution? And in what sense do we “now have” a different picture? The restorer has claimed not to have removed all of his predecessor’s varnish, so nothing can have been seen that was not visisible in 1948-9. During this last restoration Syson claimed that “every age invents its own Leonardo.” Such art critical relativism might be taken as an innocuous socio-cultural observation were it not tied to the work of restorers who claim individual interpretive “rights”. The Gallery’s handbook “Conservation of Paintings” acknowledges that pictures are now “changed primarily for aesthetic reasons” (p. 53) and (p. 45) that restorations are carried out on the “aesthetic objectives of those responsible for the cleaning”. Moreover, (p. 53) although the “different aesthetic decisions” taken by individual restorers produce results that “may look very different”, all of such different outcomes are “equally valid”, provided they have been carried out “safely”. In matters of aesthetic and artistic integrity, the “safety” or otherwise of the cleaning materials is a red herring – if pictures end up looking different, they are different, and these differences are material and irreversible. It is therefore vital that there be the fullest possible disclosure of the changes that are made – especially those made with the retouching brush. Above, Fig. 7: The Angel’s head from the “Virgin of the Rocks”, as seen in 1938. Above, Fig. 8: The Angel’s from the “Virgin of the Rocks”, as seen in 1990. This entry was posted on November 24, 2011. It was filed under blog and was tagged with "The Virgin of the Rocks", Giampietrino, Jonathan Jones, Kenneth Clark, Leonardo da Vinci, Luke Syson, Szemuveszeti Muzeum, the nationa, The National Gallery.